Although it's called plum 'wine', this beverage is actually a cordial or a liqueur. It's much easier to make than umeboshi, since the alcohol prevents any mold from forming. For equipment, you need a large, wide mouth glass jar with an airtight lid. I use a very large canning jar with a snap-on lid with a rubber gasket. You could also use a screwtop lid. The jar should be large enough so that when you put the ume plums, sugar and shochu in, it should only come to about half of the height. You'll also need a sharp tool such as a toothpick or skewer to take out the stem ends, and a scale to weigh the ingredients. Weigh your ume plums, then weigh out about half of that weight in rock sugar. If you want it sweeter, increase to 60%. If you want to less sweet, use less sugar, though I would not go under 40% since ume plums are very sour. I like to keep it simple, and use 500 grams of sugar for every kilo of ume plums. I never weigh the shochu, but there should be enough so that it completely covers the ume plums in the jar. For a kilo of ume plums I use about 2 liters of shochu. Incidentally, I usually make about 5 kilo (11 lbs) worth of ume plums in one session, and I make it every year! So, that's 5 kg of ume plums, 2.5 kg of rock sugar, and about 10 liters of shochu. Wash your jar or jars and lid well, and sterilize them in boiling water, in a hot dishwasher, in a warm oven, or with some of the alcohol you are using (shochu or vodka), just as you would when making jam or pickles. Wash and dry the unripe green ume plums, and take off the stem end bits in the same way as in the umeboshi recipe with a toothpick or other pointy tool. You don't need to soak them in water to get rid of the bitterness as you do with umeboshi, though you can if you want a very smooth tasting umeshu. Weigh your ume plums after washing and de-stemming them, to get the amount of sugar you need. Put a layer of ume plums in the jar, then a layer of rock sugar. Repeat until all the sugar and plums are used up, and press down with a clean spatula to compact it all in the jar. 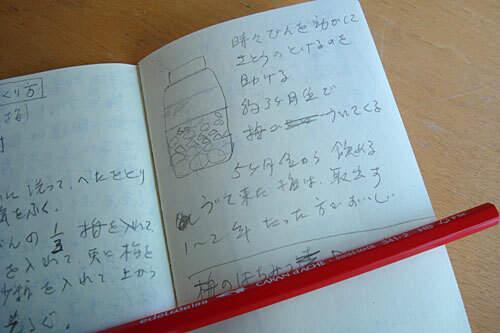 Pour the shochu or vodka into the jar until it just covers the topmost layer of plums. The jar should only be about half full, since a lot of liquid will come out of the plums. If you fill the jar too much to start with, the liquid may overflow and burst the lid off! Put the lid on securely, and leave the jar in a cool, dark place. You may want to shake the jar occasionally to help things along. After about 3 months, the plums will have exuded a lot of juice and will come floating up to the surface - remove the ume plums (you can store them separately if you like; since they are completely saturated with sugar and alcohol, they won't go bad). After about 5 months, the umeshu is ready to drink, but I like to leave it for at least a year to let it mature. Umeshu really at its best after 2 years, and just mellows and improves with age. Mellow umeshu has a beautiful light green color, like light olive oil. Some people like to eat the ume plums that have been used to make the umeshu; it's believed to have medicinal qualities. People say that an ume a day keeps your insides healthy. You can also float a single ume plum in your umeshu drink as decoration. You can drink umeshu straight, or on the rocks (over ice cubes) like any liqueur. I like to mix it with water, at about a 1:1 ratio, with lots of ice cubes. If you can't get ume plums, you can use the same method with other fruit. Strawberry wine, or ichigoshu, is very popular in Japan: for 1 kilo of good, ripe strawberries, use maybe 100 grams of sugar, depending on how sweet the fruit is. After 2 to 3 months, the strawberries will become completely white! Take them out (I wouldn't eat these), and let the strawberry 'wine' mature. You can try apricots, quince, regular Western plums, and so on. While umeshu is delicious, it is very alcoholic. So for non-drinkers and my grandchildren, I make a non-alcoholic version with honey and vinegar, called Honey Sour (蜂蜜サワー). Honey Sour is easier to make than umeshu. Just take equal amounts in weight of unripe green ume plums, honey and vinegar. The vinegar can be rice vinegar, white wine vinegar, or apple cider vinegar - any light flavored and colored vinegar will work. Combine it all in a sterilized large jar. After a while (3 to 4 weeks), take out the plums that will have come floating up to the surface; these can be eaten too, like the umeshu plums. You can rebottle the honey sour in sterilized bottles at this point if you prefer, which can be kept at room temperature. Use Honey Sour in the same way as you would use umeshu - on the rocks, mixed with water, and so on. It's also nice as a syrup on shaved ice (kakigouri). I like to bring a small bottle of it on hikes, where we mix it with clear, cold water from mountain streams. So refreshing! You could try other fruit too. Quince (called karin in Japanese) are really good as a Honey Sour base. I love the little drawing my mom did for her umeshu instructions. I think her drawings are great, and keep telling her so, but she doesnt seem convinced! Here's one she did of breakfast a couple of years back, with a wedge of melon and a bowl of muesli. I'm trying to convince her to let me show more of her drawings! Submitted by maki on 2009-06-22 12:53. Your mothers drawings are great - the drawing as art is very nice to look at - but the best part is the beautiful spiritual energy they exude. It makes one happy - she should share more of her work - it would make other people very happy just to look at them. Will definitely try out the ume drinking vinegar, once I figure out how to get my hands on some ume. Black rice vinegar, oddly enough, has become my summer beverage of choice. Apparently it's all over the place in Japan... Thank you for the recipes. And these sketches! She's got a great style, your mother, and a wonderful sense of colour. Hopefully there will be more making a guest appearance on the blog. I have a notebook of recipes from my mother that she started in a home economics course when she was a young student. Written in German using the Fraktur alphabet, it strains my language skills to the extreme, but it's great to have favorite recipes from my childhood. 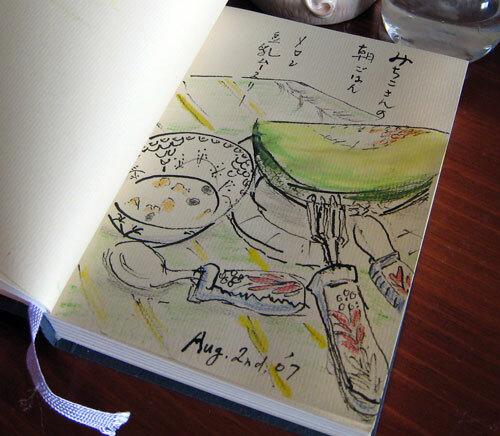 The beautiful drawings in your mother's notebook are a wonderful addition that I know you will always treasure. It would be great if she would allow you to share them with us through your blog. *Show* them - she should *sell* them! Lovely drawings! It's almost the end of the season here in Japan and making my very own umeshuu is on my list of things "to do - or BUST!" - so thanks for reminding me! The wording in the sour recipe was not quite clear I think, so I've edited it. Basically you just wait until the ume plums come floating up to the surface - my mom says it should take about 3-4 weeks for that to happen. Good luck making umeshu and/or honey sour! Your mom's drawings are beautiful! Love her use of colours! Would love to try making umeshu myself, since I enjoy it quite a lot. Not very sure if I can find any ume plums in Melbourne though. Would anyone be able to help with that? All this is mind blowing... Thoughts on fermenting soy sauce? Fermenting soy sauce...something a sane human being doesn't do :) It takes at least a year or more, and things can go wrong. Some people do make their own miso...but again, it helps to have like a cool cellar or something, and takes at least 6 months to a year to get something usable. Your mother's drawings are so beautiful. I find looking through family cookbooks so interesting, but this one looks particularly interesting, what with the little diagram. I think things like these really give you an insight into your parent's lives, and the way they think. What great, detailed instructions! It's fascinating to know how this and umeboshi are made. Unfortunately, I can't get ume where I live. Have you tried using any other kinds of fruit? What do you think would produce the most similar flavor? I have made this with small fresh cherries from the tree. It is wonderful. I have a question about umeshu. You call it plum wine, but is it always considered plum wine? I ask because I bought a plum wine in the United States and it was syrupy sweet and made for a dessert wine. I had not bought umeshu until I arrived in Japan, and had not tried it until I read your article. While I enjoyed the taste (sweet, but that note of sour ume), it wasn't what I was expecting. If umeshu is plum wine, what is this other substance? Or is it a matter of the variety? Choya was the brand of umeshu, and I believe Gekkeikan was the other substance. The sweetness of umeshu can vary a lot according to the amount of sugar. In my mom's recipe, there isn't that much sugar, although it is still sweet. Some people use a lot more sugar - the equal amount in weight to the ume or even more. In Japan it is drunk on its own usually, not as part of a meal, but if I were to serve it as part of a European/Western-structured meal, I'd definitely serve it as a dessert wine. Choya is a mass market brand of umeshu, while Gekkikan is a similar brand of sake. So...maybe you were served something that mixed the two? I believe Gekkeikan also makes an umeshu (or *something*) called Plum Gekkeikan. So this could still be umeshu. I don't remember Plum Gekkeikan being very good when I tried it, but that was a long time ago. Chōya seems to be better quality. i'm ume-obsessed and like to ingest it in any way possible. also, your mother's drawing are so freaking cute! i hope she feels the love from her justhungry fans! Thank you so much for sharing your mum's recipes. Is it ok to leave the ume in the jar or is it a must that you removed it after 3 months? Your mum;s drawings are super cute... do share more ! Thanks for your recipies and especially ume sour. I will definitely try it our next year when fresh ume are available. I am a great fan of everything with ume in general and umeshu specifically. I got so much into it that I did some research in Japan. I found out that there are more than 300 private Umeshu labels that produce a large variety of Umeshu. The flavors are very different and range from sweet to sour and sometimes even include other flavors such as Shiso, Yuzu or ginger. I started to systematically collect information on these private labels and share it with others on a new portal. PLease check it out and have fun! I have a question- when are ume in season and do they sell them online? They look so much like limes that when I go to the asian markets I don't know what to look for. Thanks! Fresh ume look nothing like limes...unless your limes are not the kind of limes that I think of (green citrus fruit looking like lemons). Fresh ume look like small, hard yellow apricots. They are in season in May-June. I don't think they are sold online, but I have heard from people in Washington State and Georgia that they have seen them sold in stores. Thanks! I will definitely look around that time. I've been wanting to make this for over 2 years now. LOL!! I've come across information on Chowhound to the effect that Mitsuwa ships fresh ume by mail in season (in the US). Apparently they're not listed on the website; you have to order by phone. I just came across this and I am so excited to do this next spring! Yours looks like the perfect proportion. My friends mom made some for me once and it was so nicely balanced but every other one that I have tried since are soooo sweet! Since quince are in season now I wanted to make the honey vinegar mixture with the quince. Do I need to peel and chop up the quince? Hi! Love your mom's drawings. Was also wondering; as I live in Chicago is there a certain place I could purchase the ume plums from? also where would I be able to purchase the other 2 ingredients (ice sugar and the shochu)? Please advise. Thank you so much for listing this wonderful traditional recipe which is surely a boon for these recessionary times! I live in San Francisco and so had bought some Umeshu at a local Chinese store noticing that it seemed to be very popular. I believe the empty cylindrical glass bottle with the re-closeable cap with a good rubber seal built in will be PERFECT for making a batch of my own with your recipe. THANK YOU! I tried Umeshu when I was in Japan and I would like to make my own. I have one question, though; what alcohol percentage would you recommend on the shochu because I know they come in different varieties. Hello! Thanks for the recipes and explanations :)I'm living in Japan and making my own ume wine and syrup for the first time. For the wine, I used ume and red wine - my friend's recommendation. Not a fan of alcohol, so the red wine is perfect cos it's sweet and doesn't have the usual bitter taste of alcohol. My ume syrup is not working out so well though. The ume have turned yellow and are already floating, even though it's only been a few days. Some of the ume at the top are not covered by the vinegar and have turned brown. I was wondering if you could help me out with umeshu, Maki - I started a batch a few days ago using brandy and honey, but some ume are already starting to float in the jar, plus there's this weird brown substance that has gathered at the bottom of the jar. Would you know if that's an indication of something wrong with the batch? Thank you so much! Glad you managed to finally settle down in as beautiful a place as you have in France - here's to an enjoyable life! The honey is probably the culprit here. Assuming you are using liquid honey, which melts into the liquor immediately, it will cause the moisture or juice from the ume to come out much faster than it will with rock sugar or even with granulated sugar. Normally, the ume fruit get permeated with alcohol, then the juices get slowly extracted into the liquor. Anyway, you probably don't have much to worry about at least as far as the liquor itself goes, but the ume plums themselves will probably have to be fished out and discarded after a year or so. If the brown substance bothers you, decant the liquor before you consume it. Thanks a lot for that explanation Maki! Yes, I did use liquid honey - I was all ready to go out and get new ingredients to start another batch, so that's really assuring since I thought it was some kind of weird mould or fungal growth that had somehow entered the container, but it didn't smell as if it had spoiled, just the sweet scent of honey with heady notes of brandy. Some recipes over at Cookpad use honey as well, but none of them mention this happening - maybe the type of honey affects it as well? I wrote to another blogger living in Japan (a Swede) who was making his umeshu with brandy, and he replied saying that the ume shouldn't be floating - is there any explanation as to why they float? Does this mean the ume can't be eaten, though? That's a shame - I was looking forward to those, since I really love them. Well, at least I suppose I can call this nigori-umeshu in a way, haha. Thank you so much again! 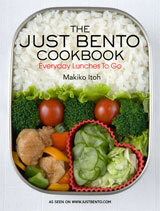 Eagerly awaiting your cookbook as well, since I bring a bento to school almost everyday for lunch and it'd be nice to have a few more ideas for dinner/lunch. OK, about 5 minutes after posting my comment, my curiosity got the better of me and I tried the floating plum batch. It kicks like a mule! I wonder can I replace the Ume fruit with unripe Ambarella? I think its equally sour but is harder and crunchier than Ume. Its pretty hard to get Ume from where I came from. You can use unripe normal plums, they just make it have a slightly more fruity taste, nothing major. I can't get Ume in New Zealand, so I get free plums from my grandparents and use those. Similarly the ume from the hachimitsu sour, do they go bad? I tried making the Hachimitsu Sour a month back with rice vinegar, honey and an orange, satsuma and a lemon. It turned out really nice, though I removed the lemon after only 2 and a half weeks and left the orange and satsuma in for another 2 and a half. It made it a nice, mild sour without being too tart-like. I'm definitely sticking to this recipe, I'm going to try Umeshu next :) I've made it and sake before but I wanna do it again. My wife's grandmother always made it and served it whenever someone had a tummy ache. Years ago, she brought some over from the little country and we've been trying to match the flavor with every year. Now we've planted two kinds of plum trees in the backyard and are just getting our first batch this weekend. Not much but we'll hope for more next year. And here's a tip for the leftover plums at the end of the process: slice off the fleshy parts and put them in a simple coffee cake. Pour a little umeshu over each slice when you serve it. You won't regret it. Just made a batch - I've lived in Japan for 17 years and have never made umeshu before. Can't wait until June 2014, then June 2015.. I got a bottle of rather good umeshu,Manzairaku *Kaga *Ume-shu, and was wondering what foods to pair it with? It taste great on the rocks! And I would like to try brewing my own, but a question came to mind. Would a hot and humid tropical climate be good to experiment brewing umeshu in? When my 96 year old Nisei neighbor passed away a few years ago, we found over two dozen quart jars of umeshu in her cupboards. Some of it was from the previous year, but she had made most of it just a few months before her death. I remembered how she would decant the liquor into decorative bottles and gift friends every Christmas. I also remembered how she had told me how difficult it was to find the ume now that the ume trees were being taken down in the San Francisco Bay Area to make way for development. I couldn't stand the idea that her heirs were going to throw out something she had spent so much effort on, so I carted them home. A few months later I decanted several jars and dispersed them to our mutual friends as a momento of a wonderful lady. I also packed some of the drained ume into small containers and took them to the local Japanese Senior Center where it was a big hit. The ume were still nice and crunchy. I have quite a few quarts left. And every time I see them on my top shelf, I smile and remember my friend. But I am not much of a drinker, and I'd like to find some other uses for this luscious liqueur. So far topping off a glass of dry sparkling wine is the best I can manage. Or maybe in place of Grand Marnier in a jam recipe.